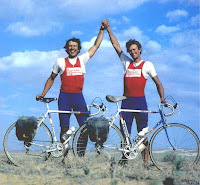 While researching the history of my new-old Raleigh, I came upon a reference to the journey of two cousins, Richard and Nicholas Crane, who wrote a book about riding their Raleigh SBDU bicycles all over Asia in 1986 with minimal baggage. I recall seeing a British television program about cycling in which someone showed how he would jump on his racing bicycle and ride off to India, with a credit card, some spare change and a sawed-off toothbrush, eating local food and sleeping wherever. This sounded to me in the spirit of the Cranes so without further ado I found a used copy of their book, which has been out of print for years. “Journey to the Centre of the Earth” is a wonderful book, firmly in the tradition of the Ripping Yarns/Monty Python/Eccentric Englishmen School of Travel. Why it is out of print is puzzling as it is well-written, colourful, and quite quite mad. The Cranes, in various family configurations, had raised a considerable amount of money for the charity Intermediate Technology (IT), now known as Practical Action, through original and ambitious athletic adventures, such as “Running the Himalayas,” and “Bicycles up Kilimanjaro.” IT works to assist the rural poor in developing countries to work themselves out of poverty using their own skills and local resources. A year after cycling up Kilimanjaro, the Crane cousins were having a drink at the Hand and Shears pub by the Church of St. Bartholomew the Great (could anything sound more cosily like the Shire?) in January 1986 when the subject of the next expedition came out. This was to be something ambitious yet again, but lightweight, no support crews and completed in two months. The key concepts that subsequently emerged were: “dangerous without being suicidal;” “exotic without being obscure;” and “awkward, without being impossible.” A number of ideas were debated and discarded–my favourite being “Mules from Montana to Minnesota”–until they looked in the Guinness Book of World Records and saw reference to “an as yet unpinpointed spot” that is the land most remote from the open sea in any direction. The Cranes decided to pinpoint that spot and thus began their Journey to the Centre of the Earth, which was apparently somewhere north of Urumqi, in China’s most western province, the Xinjiang Uygur Autonomous Region. Of course, flying to Urumqi, a city that had 900,000 inhabitants at the time of the trip (since blossoming to 2.3 million and the scene of ethnic rioting in July) and hitching a ride to the CoE would have been too simple. The Cranes thought: “If we’re going to the most remote place in the world from the open sea, where do we start?” The answer, obviously, was at the open sea and since the distance would be far too great to walk it was decided to cycle. 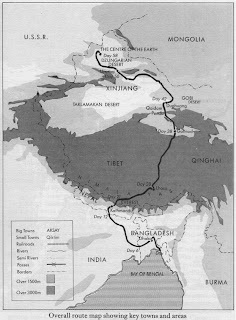 The most direct route was from the Bay of Bengal over the Himalayas, through Nepal and Tibet, and on to the great desserts of Central Asia. This was provided that the Chinese authorities would allow the expedition to enter Tibet from Nepal and continue onwards, which in 1986 was a pretty major leap of faith. Of course, since they had not yet plotted where the CoE actually way, the Cranes did not trouble to note on their maps how close it would be to the Russian border. The plan was to get going on May 1 and complete the trip in 50 days. Considering what it takes for me to organize a simple group cycling trip to Europe, the idea that they could arrange all this in only four months seems amazing. Two weeks before their departure, they no bikes, no special clothing, no air tickets, no visas for China and India, no Chinese vocabulary, so they did leave things pretty much to the last minute. Budgeting £2500 each from their own savings, they relied on donations of equipment. I was gratified that Raleigh’s support was nicely recognized. Ten days before departure, they went to Ilkeston where Gerald O’Donovan, the Godfather of the Raleigh Special Bicycle Development Unit (SBDU) and the man behind the frames used in Panasonic’s 1980 Tour de France victory, measured them up and built up a pair of Reynolds 753-tubed frames (similar to my Heron) which were then outfitted with an eclectic parts mix. I began to realize how concerned the Cranes were about weight when I read that neither bicycle had a front derailleur but the rider employed the heel kick-down, finger pick-up technique for switching chainrings. Throughout the book the Cranes are constantly fiddling with drill bits and knives to reduce weight wherever they can even further. The book includes Appendices listing all their equipment and there wasn’t much there. The bicycles, with heavy Specialized 700x35C tires, each weighed 22 pounds (9.97 kg) and carried an additional 18 pounds (8.3 kg) of gear. With these few possessions, the intrepid Cranes launched themselves out of Dhaka, Bangladesh and began the long ride north through heavy traffic, drawing huge (and somewhat frightening) crowds whenever they stopped. By the second day a bit of friction had developed as the Cranes discovered they had different riding styles and outlooks and although there would occasionally be some stressful moments in the relationship on the road ahead they managed impressively well. The book was written by both of them contributing different sections, with the authorship usually identified. From the crowded madhouse that is Bangladesh, our travellers crossed into calm India and then rolled into Nepal. 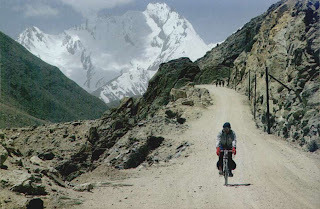 From tropical humidity and heat they moved into the cool dryness of the Himalayas and then onto the desolate Tibetan Plateau, cycling a road that the Chinese had newly built and opened to traffic only a few months before. On they ride, relating their adventures with boyish enthusiasm. 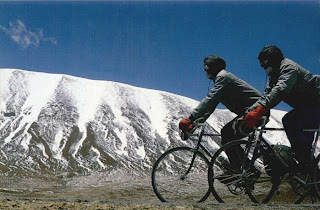 Although they had a very positive outlook, the Cranes suffered some hardships as they slept in caves, fought their way through snowstorms, suffered from thirst and hunger and still managed to pedal 200 kms on good days, an impressive athletic achievement as often the roads were poor or even non-existent. They met a variety of people who were almost always helpful, from nomads to truck drivers to road repair crews, and who must have been entertained by these Brits who did not speak any of their language but who instead cavorted and pantomimed their way across some of the world’s most inhospitable terrain, crossing the Gobi, Taklamakan and Dzungarian Deserts in their quixotic quest. One hundred kilometres out of Golmud we stopped to gaze in awe at the emptiness. It seemed unreal that we had crossed such a large distance of totally featureless terrain. The road was essentially a continual straight. Though 3,000 metres above sea level, all the way we saw no hills, no mountains and it was hot, dry and flat. Nick sat on the edge of the tarmac for a rest. In deference to the enormity of the cosmos, I took a short walk out across the hard-baked salt crust beyond the telegraph wires. There was nothing between me and eternity. I will not tell you how the story ends, but leave it to discover for yourself, but by the time they stopped riding their dependable Raleighs (two flats each during the whole trip, and a gear cable that needed replacement after some children fooled with it), they had cycled 5301 km (3293 miles), of which 1473 km (915 miles) was on dirt, and ascended 26,680 m (87,532 feet). As a foreigner living in China from 1987-1989, I can say that I was surprised by the lack of interference from Chinese officials as they roamed all over the country but in the end even the ever-cheerful Cranes could not escape the long arm of the Public Security Bureau. But they remained resourceful and independent to the end, although not terribly clean. Although the Centre of the Earth may not ever become the tourist attraction they thought it might be while planning their trip in London, this book is a testament to the spirit of discovery, not to mention Ilkeston-built Raleighs. As mentioned, the book has not been in print for years but used copies are easily found if you check amazon.com or alibris.com. My copy is hardbound but it came out in paperback as well. The entire book has been scanned (well, one chapter seems to be missing) and can be found on-line here, which is where I also found the photographs.